Use Google Maps to plan your trip … gee, it’s easy! When I mentioned that I’d never been to Sun City, I was looked at as though I’d grown another head. “Never been to Sun City …. Never? ?” Well, lots of people haven’t, but would like to go. Accommodation is one thing that you don’t need to be concerned about – Africa Places will sort THAT out for you, all it takes is a phone call. 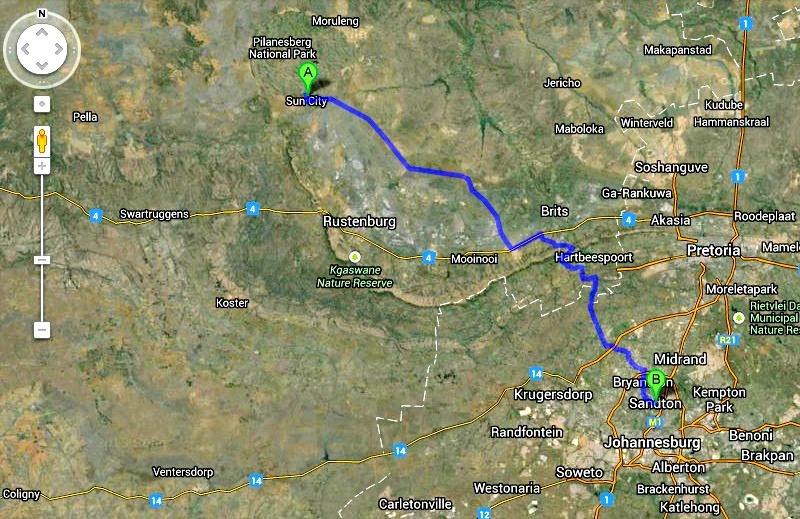 Looking at the map on Google Maps, and planning my route from Sandton I saw that the trip is over 160km and depending on how low you fly, will take up to two and a half hours each way, without stops! Why, then go for the day? At least overnight there and eliminate half the travelling time. And you do know how I like to stop on the way to anywhere – making my journey part of my holiday. And guess what? Never having been to Sun City, I’ve also never been to Hartbeespoort Dam either! Shock and horror! So I want to explore a little. I hear the Dam is very pretty – so why not take a picnic, as one does, and break the journey at the Dam and enjoy the view, browse through a few shops (they MUST have shops) and see a little of what people have been raving about? So I started exploring my proposed route on Goole Maps and went to Google Street-View. I found some lovely little places where we can make a short detour and unpack the picnic, sit and enjoy the views for half an hour. There is a place right next to the water, about 2 km off the “planned route” – ideal! Or we could opt for the complex right next to the road, called Chameleon Village. Over the road from that, is what looks like a whole lot of craft shops that one can amble around. I love Google Maps! I have been able to follow my route on my computer. I can see the terrain I will be going through and I have been able to spot places that I want to explore and investigate. It’s a fantastic tool to use to plan a trip with. And then, there it is! Almost like I’ve been there before! Start your holiday off right … have a picnic! Today’s modern life is frenetic, for a variety of reasons, which I don’t need to examine now, but when on holiday, it doesn’t need to be that way too. One of the special memories I have of growing up is of the picnics we used to have as a family when travelling on holiday. We’d usually leave home when it was still dark and as the dawn broke mum would start handing over a snack to us kids in the back seat. This was usually an egg sandwich aimed at tiding us over until we “stopped for breakfast” at the side of the road. And even though we were on a mission to reach our destination, dad would always be on the lookout for laybyes and when a likely one was spotted he’d pull off the road and we’d stretch our legs as the basket was emptied on the roadside table. A tablecloth was put out and Tupperware boxes containing sandwiches, cooked sausages, hard-boiled eggs and pieces of chicken made their appearance. All prepared and cooked the night before by our forward-thinking mother. A flask would also be opened and four plastic mugs would be filled with steaming tea. The family was able to sit together, talk about the trip, the next destination and watch other cars speed by. The fact that dad was relaxed, not rushing off to work or at meetings – but out in the open, in shorts, with an open-necked shirt and not wanting to dash off made made an exceptional memory even more lasting. A few years ago, the wife and I went on a long car journey. We had our “padkos” with us too. We stopped during our journey and had our own picnic. The good memories came flooding back. What was even more pleasant was that we weren’t in some noisy, glitzy mini-mall of petrol pumps, ringing tills and milling people all trying to fill-up, hit the loo and grab some fast food in as short a time as possible and then speed off to the next pump-stop 500km away! I’m of the firm opinion that the journey should be part of the holiday. Especially when there are children in the car too. It’s all very well when planning the holiday to consider where to stay, and how to get there – and even what to do when you’re there. But what about the process of getting there? I’m suggesting a whole new way to look at the trip from A to B. Plan the route on a map, not your previous recollection! Examine where you’re going through, what is there to see (like a monument, or an historical landmark) and do? Is there some special place that will thrill the children to go to? Africa Places is the leading South African company for sourcing Sun City Accommodation – this could be the perfect location for your holiday. The helpful consultants at Africa Places will take the time to find you the best option. If that’s not your cup of tea, Africa Places will source other, similar accommodation for you and help to make your holiday complete. Contact Africa Places.